The join.me & LiveChat integration enables you to access your visitor’s screen with a few clicks. You just need to send a client an invitation to screen sharing. By accepting the invitation, the customer will automatically start sharing the content of his screen with you. join.me is an online meeting and conferencing tool. Thanks to it, anyone can join a call from any device, whether that is internet calling (VoIP) or phone lines. The solution makes easier to hold video-conferences with the ability to share screens, make recordings, add and remove participants, and more. During the meeting, you can add and re-assign a person who shares the screen at any time. You can invite up to 250 participants, schedule meetings and send invitations with the built-in scheduler or directly through Outlook or Google Calendar. join.me offers also phone numbers in over 40 different countries to empower worldwide conferencing. Integrate LiveChat with join.me and make sure that you will cover one additional help channel! Because helping your customers via screen-sharing session can save them a lot of time and trouble. All that you have to do is to link LiveChat with your join.me account – and that's it! Whenever a need will arise, you can start a screen-sharing session with your customers with just a click of a button. One click is all it takes to access customer's browser window in real-time, solving issues faster and providing an exceptional customer service. Join.me seamlessly integrates with LiveChat, making it easy to immediately understand what issue the customer is having. 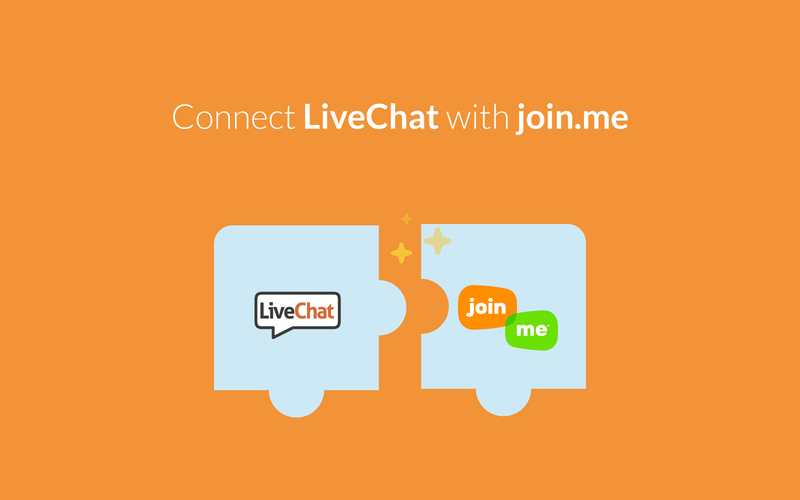 Start using LiveChat with join.me now!